Tune in to this Wednesday's Afternoon New Music to hear an interview with Kate Olson and Naomi Siegel of the improvisational chamber duo, the Syrinx Effect. Olson (saxophone) and Siegel (trombone) manipulate the natural resonances of their instruments and use a variety of electronic effects to create atmospheric compositions that push the limits of their instruments. We were able to sit down with them to talk about the history of the band and where they hope to take their music in the future. Listen! 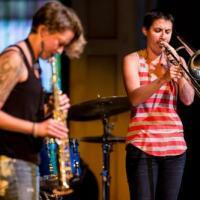 The Syrinx Effect is a duo project created by Naomi Siegel and Kate Olson that consists of trombone, soprano saxophone, and effects. Like our namesake, the “voice box” of birds, we create two separate resonations, high and low, and allow them to interact with our environment. and sometimes a romp. We don’t take ourselves too seriously, but the creation of music is a life or death undertaking (no pun intended).